Although Israel for the moment has stopped dropping bombs on Gaza, this article remains pertinent. As Lynda Brayer says below “the Zionist war, both cold and hot, against the Palestinians has not stopped for even one day since 1948, and that it went into relentless high gear since 1967 and continues unabated.” The current ceasefire could collapse at any time. Israel has already violated it twice most recently killing one Palestinian and wounding 19 others near the border fence of Khan Younis in Gaza. They are farmers who had come to inspect their lands after Israel’s bombing spree only days earlier. the Western vision or understanding, although a quick perusal of the websites of the Palestine Center for Human Rights located in Gaza City, Machsom Watch and Btselem provide chilling and detailed information of this continuing quotidian warfare. Their English translation of the name of the military operation is inaccurate, and I suspect that this is deliberate. The name in Hebrew is ‘Amud Ashan – “Pillar of Smoke” a metaphor created to elicit deliberate comparison in the Israeli mind with the pillar of fire and the pillar of clouds from the biblical story of the Exodus according to which God led the Children of Israel out of their slavery in Egypt on their journey to freedom in the Promised Land! Of necessity, this name and this image brings about an inversion of the rôles of the Israelis and the Palestinians: the Israeli aggressor once again becomes the persecuted victim, as per the Exodus story, while the Palestinians, immobilized and strangled in the ghetto-prison of Gaza, enclosed within electrified walls and fences, are transmogrified into the pharaonic terrorists relentlessly and heartlessly persecuting the innocent Israeli victims. This inversion involves more than labels: besides inverting the moral order and the facts of reality, it serves, once again, to reinforce the image of the Palestinian as enemy, as demon, as sub-human, an entity not entitled to any respect or consideration! It is a tried and tested formula for distracting attention and blame from the real perpetrators of death and destruction on to the victims of those acts of aggressions. Political assassination is the specialty du jour of Israel, a praxis adopted wholeheartedly by President Obama and his own personal drone “kill list”. Using murder to deliberately undermine the political echelon in the hope of weakening it with respect to the possibility of political recuperation after a war, is an act which violates the third principle of legitimacy of the laws of war – the principle of chivalry, a principle recognizing the humanity of the enemy. The enemy must be treated with respect in order for normal social life to be commenced, or resumed at the end of hostilities. Clausewitz’ aphorism that war is a continuation of politics is not descriptive but prescriptive. Negotiations leading to peace must be the purpose of a legitimate war of defense. It is in this light that one should understand the information released by Gershon Baskin, an Israeli political activist, that the Palestinian leadership in Gaza, including Ahmed Jabari, had received a draft for a truce agreement just hours before his assassination. It is therefore obvious that the assassination was executed for the specific purpose of preventing such a truce. What this indicates, at the very least, is flagrant bad faith on the part of the Israelis, but more importantly, it is another instance of provocative treachery , a subject which deserves a separate analysis. The right to protect human life is absolute, even if the means used are conditioned. Therefore, according to all human norms, natural law, legal norms and international law and jurisprudence, the Palestinians have a legitimate right of response. It must be remembered however, that the Palestinians have been denied a state and an accompanying army by Israel and the United States. Therefore the response available to the Palestinians in Gaza is extremely limited and is confined to rockets fired into Israel. These rockets are primitive weapons and not extremely accurate which is why they have been defined as fireworks. But that is all that the Palestinians have for their defense. This response is the only avenue open for a society under military attack to try and force the cessation of such an attack when he will not negotiate with you in good faith. The Israelis are proud of the fact that their army is the fourth largest in the world, and as far as they are concerned, also the best, the most effective and the most moral! Because of the exponentially huge disproportion in power between Israel and the Palestinians, the Palestinians simply cannot afford to react to each and every attack against them. They have to carefully and prudentially weigh their possibilities of response which is the reason why the Israelis never have to cease their relentless attacks of varying intensity. But it is also the disproportionate attacks by the Israeli army that violate the principle of proportionality underlying legitimate warfare. (Doreen Ingrams. Palestine Papers 1917-1922 Seeds of Conflict. London1972. pp. 61 and 73). We could therefore come to the following conclusion at this point. The Palestinians have the right to resist Israeli attacks on several grounds. Firstly in response to the Israeli provocation in the form of the assassination of Ahmed Jabari . (We can imagine an Israeli response to an assassination of Ehud Barak or any other minister). Secondly they have the right of resistance to the actual decades long Israeli genocidal control over Gaza which is bringing about the actual physical demise of the population which exhibits a general level of ill-health attributable directly to the Israeli stranglehold over the territory. Thirdly, they have the right of resistance against the continuing incursions, raids, arrests, imprisonments, and suppression of economic activity in the West Bank/East Jerusalem. And fourthly, the actual fact of their being forcibly denied their political rights justifies resistance. The term ‘terrorist’ is not a legal term and has no legal reference. It has been manufactured in order to bypass the limitations that international law imposes with respect to the manner of dealing with an adversary. It is used to demonize those people who do not agree with the US/Israel/European hegemonic demand and rule of the world and it is especially used in order to deny such people the right of resistance, the right to struggle as freedom fighters. It is this terminology which has created such confusion and discrepancy in the general public’s understanding with respect to the reality in Palestine and the actual state of affairs that prevails there. But we may ask the further question as to why are Palestinians are seen in the West as “terrorists” and intransigent murderers, a people who understand only violence and not peace? In order to understand this conundrum, it is necessary to understand the nature of American society in particular, and its mechanisms of control. The United States is a capitalist society in which power is exercised by the financial-media-military-industrial complex. A main source of capitalist exploitation is the oil deposits in the Middle East, its refinement and distribution to the rest of the world. a title straight out of George Orwell’s 1984 – was formed to exercise further control over the population through the use of policing power. The events of 9/11 have been exploited exponentially by both the media and the DHS towards the demonization of Islam and Muslims, and Palestinians automatically fall into this category. All are deemed to be terrorists or potential terrorists, and therefore they are, by definition, the enemy. The level of propaganda generated by the media branch of this complex, to which the populations in the West are subject, in particular in the United States and Israel, has brainwashed the population into an automatic negative response to all Muslims, Palestinians included. the ius sanguine if they had not been born in Palestine or Greater Syria. Tags: australians, Hamas, israel and palestine, israel and palestine conflict. Filed under Israel and Palestine, israel and palestine articles, israel and palestine conflict, israel and palestine religious conflict, map of israel and palestine by Father Dave on Nov 27th, 2012. Comment. More updates from Bob Birch, currently stationed on a farm in the West Bank. It is a tragic story, made all the more tragic by the fact that few in this country care about what is going on. Thank God for Australians like Bob who are making a difference. This is Khalid, the owner of the khan and orchard where I have been staying lately. He is a very dynamic character, who speaks rapid-fire Arabic or his own special brand of English (“You, he go, stay, come my house, eat sleep, good, you come”) and so on. He is very hospitable and welcoming…….and also very tough. The settlers from Maál Shivona settlerment nearby want him out. They want his land, his orchards, his olive trees and his historic house, but most of all they want the spring which is on his land. They have offered him millions of dollars and a US passport to sell up. When he refused they stole his horse, injured his dog, stole his tools, wrecked his car, cut his electricity supply and broke into his house repeatedly, destroying all his furniture and leaving the place a shambles, with graffiti written over the walls. Finally, they attacked at night when the family was sleeping, beating all the family members and putting his wife in hospital. 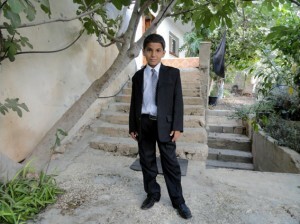 During the attack the eldest son, Jamal, used a hoe to defend his mother, wounding a settler. 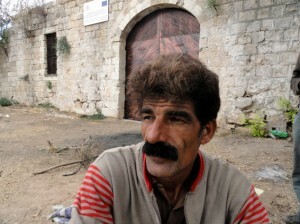 When the Israeli police and army arrived they arrested Khalid and Jamal. (The script could have been written by Franz Kafka.) They were jailed and ordered to pay the equivalent of $10,000 in order to secure their release, leaving them virtually penniless. A jail sentence still hangs over their heads. Of course, nothing happened to the settlers; they appear to have total immunity. Now a European Union NGO has put up the money to erect steel doors and window shutters so that the house can withstand further settler attacks – hopefully. ISM members maintain a vigil at the farm night and day, hoping by their presence to make it safer for Khalid and his family (who, for safety, now sleep in the village). At night one is aware of the menacing presence of the Maál Livona settlement on the nearby hill. On the opposite hillside the lights from the huge settlement of Eli are strung out for 25 kilometres, testament to the unceasing land grab which is taking place. What is happening to Khalid is not an isolated incident; all over the Occupied West Bank similar stories can be told, stories of greed and brutality being met by courage and steadfastness. Tags: australians, israel and palestine, israel and palestine conflict, settler, West Bank. Filed under Israel and Palestine, israel and palestine conflict, map of israel and palestine by Father Dave on Oct 30th, 2012. Comment. Ilan Pappe was Professor of History at Haifa University in Israel when he started publicly questioning the official narrative of his country – that it had been a ‘land without a people‘ when the State of Israel was founded in 1948. He is now based in Britain, and lectured across Australia during the month of September. Below you’ll find the video of Pappe’s first address in Australia. It was given at Sydney University to a full house. Below the video you’ll find links to a video and audio recordings of a variety of other appearances Pappe made in Australia. Simply, the man is extraordinary – his intellect, his wit, his clarity, his moral integrity, his humility, his courtesy all combine to make him the most formidable speaker yet to talk truth to power. 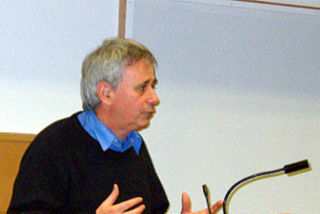 Ilan Pappe has had audiences riveted to every word as he makes his way from city to city on his Australian lecture tour. Those who have heard him more than once are just as captivated the second and more times around which is due to his amazing ability to construct a very human story out of the historical facts, so even those who thought they’ve heard it all before, feel their eyes tear up and their hearts go out to the forgotten Palestinians. At a dinner in Parliament House last night, he said to forget about the peace process, Oslo, solutions and think instead about the sheer cruelty of what is being done to the Palestinians on a systematic day-to-day basis that never captures dramatic headlines, and yet cumulatively over decades, is worse than even the worst days of apartheid in South Africa. The simplicity of his words struck home: he was holding up a mirror to our own human condition and vulnerabilities. Note that these audios can be downloaded as well as streamed. An erudite presentation by Pappe, which deserved a better context than these presenters were able to provide. Tags: australians, haifa, ilan pappe, karkar. Filed under Israel and Palestine, israel and palestine articles, israel and palestine conflict, israel and palestine religious conflict, map of israel and palestine by Father Dave on Sep 23rd, 2012. 1 Comment.